Pat Scolaro is a neighborhood treasure. Not only has Pat been working on behalf of Burleith for forty years, but she also lives a fascinating life. So for this web post (which appears in the June 2018 Burleith Bell), we chose Pat for our focus. World traveler Pat Scolaro in Cape Town, South Africa. In 1956 when Pat, a recent business management graduate of Penn State, interviewed for jobs, one prospective employer commented, “I’ve never interviewed a woman before.” Her future employer, Woodward & Lothrop, was also taken aback that she would rent a car to drive down for an interview. So it was, 62 years ago, when Pat arrived in DC from Eastern Pennsylvania to forge a successful career in, yes, business management, specializing in human resource management, until her retirement in 1998. But the point here is not so much that Pat was able to succeed when the business world was not particularly open to women, but that the same attitude and abilities that she brought to her work, she brought to Burleith. While our "village in a city" is mostly calm at the moment, from the 1980s straight through to the 2010 Georgetown University (GU) Campus Plan (a process that actually lasted until 2016), Burleith was hit with challenge after challenge. And Pat was involved in almost every one. Pat and her husband, Joe (they met when he sold her a pair of shoes at Woodies) bought their home in Burleith in 1974. At first Pat and Joe, like many newcomers, were happy just joining in with neighborhood activities interspersed with their jobs, winter trips to the Caribbean, and stays at their vacation home in Marbella, Spain. Yet, starting in the 1980s Pat began to get officially involved in the neighborhood, first as the co-chairperson of the Burleith art show, an annual fundraiser for the neighborhood. Next she joined the BCA board, just about the time a developer bought Hillandale, with plans for a gated community abutting 39th Street with two entrances, also on 39th Street, allowing Hillandale’s residential traffic access through Burleith. After a two-year struggle, Burleith’s board and volunteers negotiated the tree-lined buffer zone that currently exists between Hillandale and 39th Street as well as one open entrance and one locked entrance to be used only in case of emergency. Finishing up the 1980s, Pat stepped in to complete a vacant ANC term for a year. Pat’s next big cause came when DC Public Schools, the owner of Ellington Field, decided to sell the valuable piece of real estate in 1997. Many organizations, including GU and a retirement facility, quickly showed interest. But Pat, along with Bonnie Hardy, enlisted DC’s Councilmembers along with surrounding communities and organized a rally to “Save The Field” at the stadium using a Rocklands truck for a stage. She still isn’t sure why or how but the rally hit a nerve somewhere and DCPS backed off the sale. Following that success, Pat served two terms as BCA president right as the Georgetown 2000 Campus Plan hit the community. For those not living here at the time, the period leading up to the 2000 Plan (that process continued until 2005) was a difficult time for the neighborhood. Changes in GU’s enrollment and housing policies flooded the neighborhood with students (with very little oversight from the university), and noise, trash, public drunkenness, and a deterioration in housing all followed. In response, Burleith joined with the Foxhall and Georgetown neighborhoods to seek help with student-related problems before the Board of Zoning Adjustment. As a result, a group was formed, consisting of GU and neighborhood representatives, which Pat attended monthly for two years, to alert GU to issues regarding their students living in the community. When the 2010 Campus Plan negotiations began, Pat once again stepped up to knock on doors for a house-by-house survey of Burleith—a survey that became instrumental in the Campus Plan negotiations and helped lead to the quieter, calmer neighborhood we enjoy now. When she wasn’t knocking on doors in 2010, Pat became a founding board member and treasurer of the Georgetown Village, a non-profit community that includes Burleith and provides services and activities that enable members to live better and longer in their homes. She still serves as vice president of the Village, which now serves 200 members with 80 volunteers. So with all this service to our community, I asked her why she’s made the effort for so long. It’s not like she doesn’t have other things to do. Before retirement she spent chunks of time at her beach house in Bethany and actively supported her husband Joe’s involvement in theater. 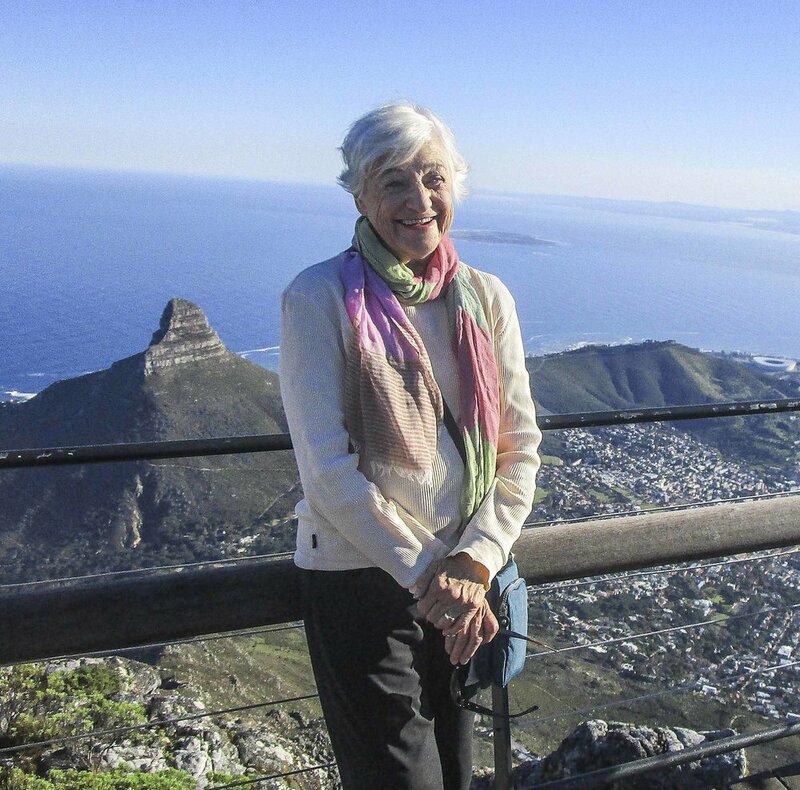 Since retirement she’s traveled to Zambia, Botswana, Zimbabwe, Machu Picchu, the Galapagos, Turkey, China, and Sicily, and her upcoming plans include the Greek Islands and Iceland. When she’s here in DC her activities include Burleith’s dining, book, and movie clubs as well as helping to steer the Georgetown Village.